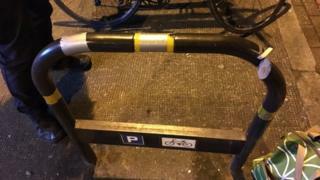 A cyclist who had her bike stolen after it was secured to a sabotaged bike rack has warned others about the "cunning" scam. Sarah King found her cycle was missing from a rack in Camberwell on Thursday night following a meeting. Ms King said she had not realised it had been cut through and then taped back together before she locked her bike to it. Met Police are working with Southwark Council to investigate the theft. Ms King, a Labour councillor, said it was the first time she had heard of a bike being stolen in such a way and wanted to warn others. She said she was "upset and shocked" to find it missing as "I love cycling in London and I love my bike". Her tweet warning cyclists about the scam has been retweeted nearly 2,500 times. Councillor Darren Merrill, of Southwark Council, said: "It is appalling that the growing cycling population in the borough are being targeted by these cunning thieves."